Bar Tartine has no real sign, but everyone knows exactly where it is. 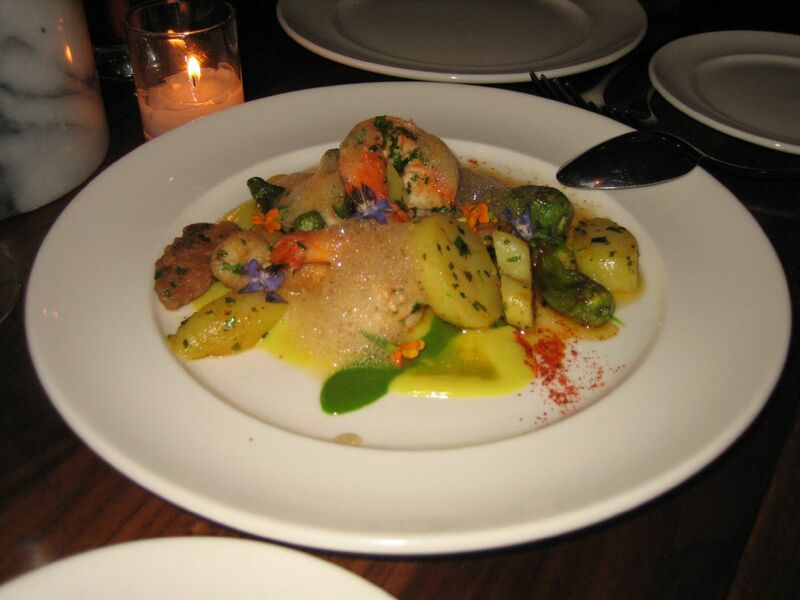 Right on Valencia between 16th and 17th in a candle lit room with wood floors and a view of the kitchen -- perfect for a beautiful Friday night dinner. 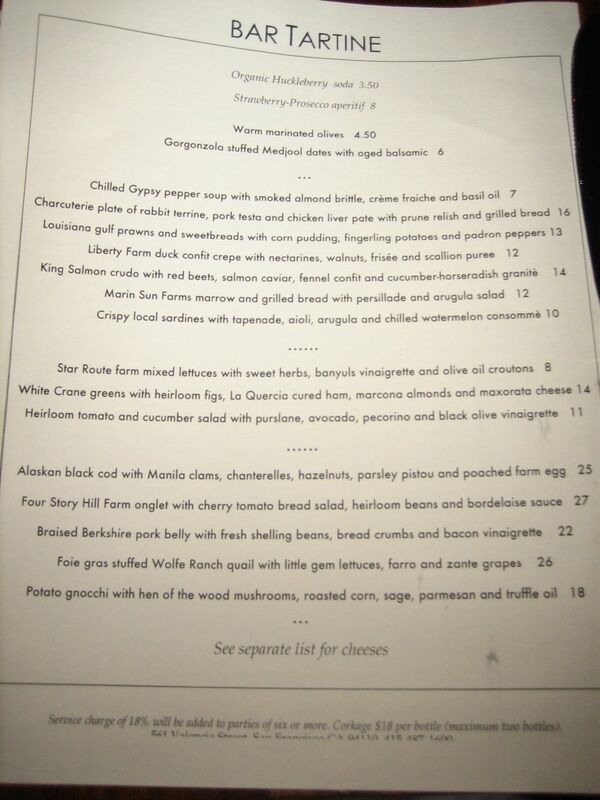 After looking at the menu we were thinking that it might be easier if we decided what we did not want to order because it would be a much shorter list than naming everything we wanted to order! We started with the Gorgonzola stuffed Medjool dates with aged balsamic. Being that I'm not a huge fan of very sweet things at the beginning of the meal, this was a little to sweet for me. The gorgonzola was clearly meant to balance and cut the candy sweet dates though it failed to do so, I was also unable to detect any tang from the balsamic. Next came a pair of starters. 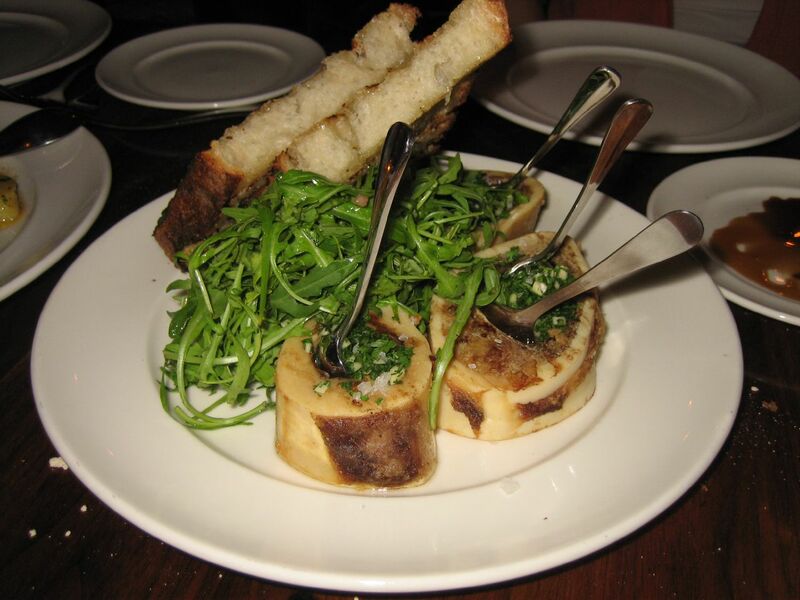 In front of me was the Marin Sun Farms marrow and grilled bread with persillade and arugula salad, which consisted of three bones sitting upright with small spoons dipped into the eye of the bone. Sprinkled on top was some sea salt and greens which looked like green onions, accompanying the marrow was some beautiful salad and perfectly grilled walnut bread. Scooping out the marrow revealed a gelatinous beefy semi clear mixture that I spread over the walnut bread. The crunch of the charred bread against the soft rich and beefy goodness was crunchy and melted in my mouth at the same time. This might've been my favorite dish of the evening. Definitely the riches savory dish we had. The Louisiana gulf prawns and sweetbreads with corn pudding, fingerling potatoes and padron peppers was much less of a revelation. Three smallish prawns nestled inside a salad of corn foam with bits of corn and bite sized pieces of sweetbread. I thought the prawn was o.k.,m not bad, but nothing in comparison to the marrow. In retrospect I should've eaten the prawn before the marrow. Our mains were excellent across the board. 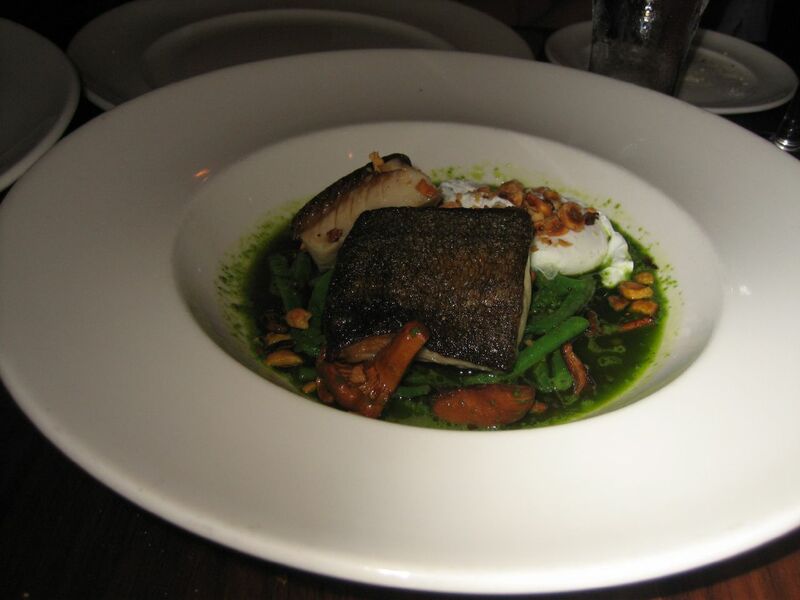 Alaskan Black Cod with Manila clams, chanterelles, hazelnuts, parsley pistou and poached farm egg was my favorite. Granted it was a light yet flavorful and well balanced dish of two succulent pieces of cod with crisped skin and a sauce of clams with mushrooms on a bed of crunch green beans. I broke the poached egg atop the cod, but it didn't seem to add much flavor and probably would've tasted better if we could've add more salt when the yolk mixed into the sauce. Next I sampled the Braised Berkshire pork belly with fresh shelling beans, bread crumbs and bacon vinaigrette which was a piece of pork belly about the size of my fist, crispy and crunchy on the outside tender and fatty on the inside with a slightly salty (in a good way) caramelized braisi ng juice surrounding it. The bacon vinaigrette with bits of bacon providing the seasoning for the beans. 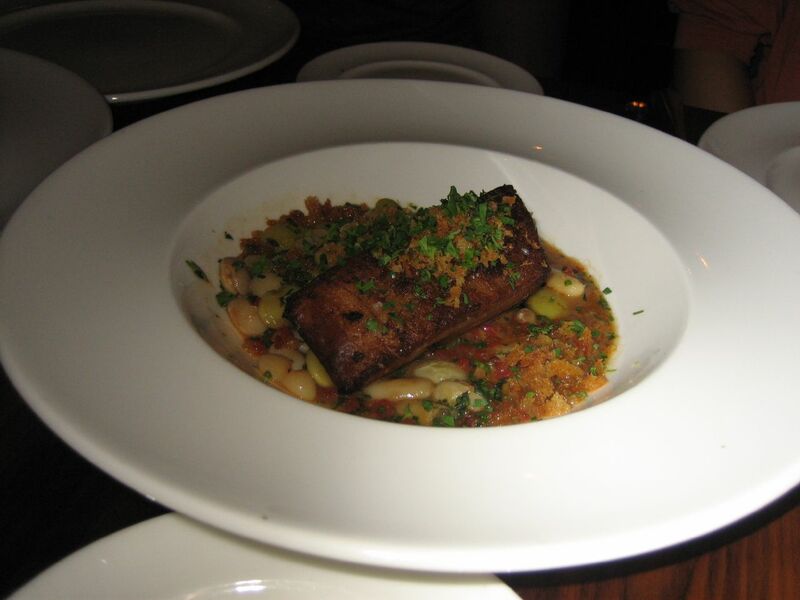 The bacon put this one over the top -- how can one argue with bacon vinaigrette atop a pork belly? After the porkgasm, it was nice to have the light and fluffy Potato gnocchi with hen of the wood mushrooms, roasted corn, sage, parmesan and truffle oil which could easily have been overpowered by the robus t flavor of the pork belly. Yet, no my friends, the gnocchi did not surrender. True, it had a soft airy texture, but it was like eating a flavorful cloud puff with sage, truffle and hints of toasted nuttiness. Desserts were the Chocolate Souffle and the Raspberry Fig Tart. I was not a fan of the Raspberry Fig Tart because the filling was far too treacle almost like a smuckers jelly, it could've done with a squeeze of citrus to cut the sweetness. The chocolate souffle wasn't much of a souffle in the traditional sense. 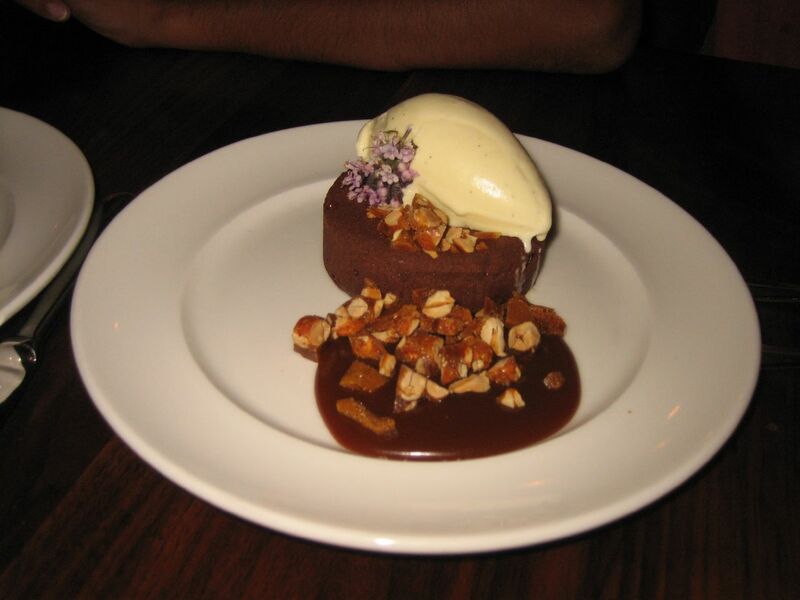 It almost the consistency of chocolate fudge, a dense rich puck of chocolate topped with a dollop of a very nice pistachio cream. We a ll commented that it tasted more like flourless chocolate cake rather than a souffle. We drank the Navarro Gewerstraminer which was very good, not too sweet and complimented most of our meal. Fresh warmed bread from Tartine was put on the table with some creamy salted butter. This is the best table bread I've ever received at a restaurant. The service was excellent, the server knew his food and the atmosphere was casual and convivial, albeit in a rather dimly lit room. My only regret is that we did not have room to sample the cheese menu. I will definitely return for that and more.